Researchers demonstrate utility of 1.9 g integrated microscope for in vivo and in vitro applications. Scientists have developed a miniaturized integrated fluorescence microscope weighing just 1.9 g, which can be carried around on the head of a freely moving adult mouse. 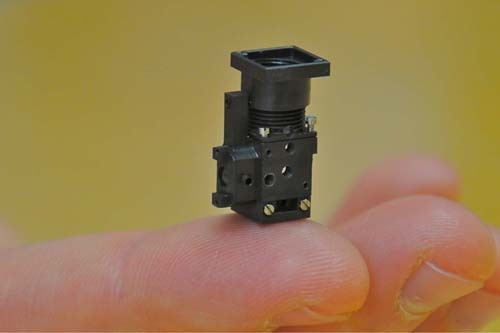 Based on readily mass-produced micro-optics and semiconductor optoelectronics, the instrument incorporates all its optical parts in a 2.4 cm3 housing. The Stanford University designers claim that in comparison with high-resolution fiberoptic technologies, their microscope demonstrates numerous advantages in terms of optical sensitivity, field of view, attainable resolution, cost, and portability, as it doesn’t require optical realignment when transported. Mark J. Schnitzer, Ph.D., and colleagues tested the miniaturized microscope across a range of applications including the visualization of cerebellar microcirculation in active mice, and tracking Ca2+ spiking in individual cerebellar neurons. They also demonstrated its capabilities in fluorescent cell counting, and for detecting tuberculosis bacteria in fluorescence assays. Prior approaches to fluorescence imaging in miniaturized format have generally required accessory, tabletop optical instrumentation, the Stanford team notes. In contrast, their integrated system has allowed a miniaturized optical pathway, data-acquisition system, circuit boards and housing with fine focusing capability, all to be kept down to 1.9 g in mass. The Stanford team claims the microscope offers a rougly 700% greater field of view, and about 500% greater transfer efficiency of fluorescence between the specimen and image detection planes compared with fiberoptic technology. Additional benefits include superior freedom of movement for the mouse (which is attached just by a floppy tether). Although electrical wires carry power and control signals and data to and from the mouse, these are fine enough to allow flexibility in terms of connection to the animal. “This is unlike fiberoptic microscopes, which are prone to exerting torque on the mouse owing to the finite bending radius of the optical fiber,” the team states. When used to visualize cerebellar microcirculation in mice, the microscope’s sensitivity and image quality allowed the tracking of erythrocyte speeds and capillary diameters with 2 second time resolution. Motion artifacts were barely apparent, they report, and were typically <1 µm, even during running. “This is substantially less than motion artifacts during two-photon microscopy in head-fixed behaving mice." The expectation was that as an animal’s activity increased, all capillaries in a field of view would uniformly have increased erythrocyte speeds and vessel diameters. However, what they found was that only a spatially scattered minority (about 25–30%) of vessels significantly changed diameters and flow speeds as the mouse switched from resting to active. “This indicates capillaries separated by only tens of micrometers are controlled nonuniformly and that a subset of vessels appears to dominate bulk effects,” they state. The microscope was in addition used to track Ca2+ spiking in more than 200 individual cerebellar Purkinje neurons. The large sets of Purkinje neurons and about 3,500% more spikes collected enabled what the team claims may be the first analysis of higher-order correlations in cell dynamics in freely behaving mice. Computational methods were used to identify individual Purkinje neurons and extract their Ca2+ activity traces from the image data. The results showed that predominantly during motor activity, large cohorts of 30 or more Purkinje neurons in individual microzones fired synchronous Ca2+ spikes. Data identified cells and their spike rates were consistent with anatomical and electrophysiological attributes of Purkinje neurons in mice and prior in vivo Ca2+-imaging studies, the authors note. “In comparison to two-photon microscopes used to study alert, head-restrained mice, the integrated microscope provides broader fields of view and decreased susceptibility to motion artifacts owing to its greater depth of field and faster frame rates.” Indeed, while two-photo microscopy allows tracking of about 100 Purkinje neurons Ca2+ spiking at less than 12 Hz frame rates, the integrated microscope enabled the scientists to monitor 206 Purkinje neurons at 46 Hz. To evaluate some of the possible uses of the system, the team generated an array of four integrated microscopes for imaging a mixed population of wild-type and erbb3 mutant zebrafish that demonstrate nerve myelination deficits in peripheral nerve cells. Images from the array clearly distinguished the mutant fish, providing initial proof of concept that arrays of the integrated microscopes might form the basis of parallel screening technologies. The researchers also used an array of microscopes to carry out cell counting in 96-well plates. They found that across about 2.5 orders of cell density magnitude, images from the microscope array combined with an image segmentation algorithm gave counts that were accurate to 4–16%, which they say is comparable to commercial counters using digital imaging. As a basic test of diagnostic utililty, the system was in addition shown to readily distinguish tuberculosis-negative and -positive culture samples stained using the fluorescent marker auramine-O.